Defenders play a crucial role in the game. One slip, and they may concede a goal that winds up costing them the game. Good right backs, like Dani Alves and Sergio Ramos, know the importance of wearing the right shoe; a shoe that gives them the support, protection, comfort and responsiveness they need to win. What do Sergio Ramos cleats, a.k.a. Nike Tiempo Legend V, have that other cleats don’t? Durable kangaroo leather for maximum protection and optimal ball touch. A snug fit for comfort and support. Hypershield technology that blocks moisture. Engineered plate for added flexibility and maximum traction. FG (firm-ground) studs for short-grass pitches. Full-length TPU for unmatched stability and durability. Impact protection from the internal heel counter and EVA sockliner. In other words, these cleats give the support a defender needs to be ready for tackles, and the responsiveness required to stay 100% focused at all times. Comfort is important, too, which is why so many professional right backs go with leather uppers. They offer both durability and comfort, so they can play their best game no matter what the weather brings. To play your best game as a full back, you don’t necessarily need to get a pair of the Tiempo Legend V soccer shoes. All you need is a shoe that provides excellent support, protection for your feet and flexibility to move swiftly at the drop of a dime. It’s not always easy to find shoes that fit these criteria, but we’ve hand-picked the top five best cleats for full backs based on durability, comfort, responsiveness and price. These five cleats have all met our stringent criteria and will give defenders the support and consistency they need to play at their best. adidas Performance Copa Mundial – Arguably the most famous soccer shoe in the world, the adidas Copa Mundial is ideal for the stopper position. A full kangaroo leather upper offers durability, comfort and foot protection. The dual-density outsole and EVA insole further enhance comfort and provide the additional support you need to withstand tackles. With a direct-injected FG outsole, this cleat provides maximum traction and footing – exactly what you need to get the ball out the zone. 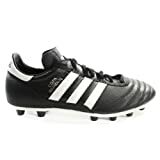 The adidas Copa has been the most popular soccer shoe on the market for the last 20 years, and is the shoe of choice for many competitive and professional defenders. Diadora Forza MD – If you’re on a tight budget, the Forza from Diadora is one of the most affordable shoes on the market, and does not sacrifice on quality. The synthetic upper is made from polyurethane, but it looks, feels and behaves just like leather. It’s durable, comfortable and supportive, so you can stay in the game even after a brutal tackle. A rubber MD outsole delivers maximum traction when playing on hard, natural surfaces, so you get the game-changing flexibility and responsiveness you want. On the inside, the EVA foam is shock-absorbing, while the fixed cotton insole provides additional comfort to get you through the game without blisters or pain. For players who want quality and durability, but don’t want to spend a fortune on shoes, the Diadora Forza is the right choice. adidas Performance X 15.4 – One of adidas’ most popular soccer shoes, the Performance X 15.4 is a versatile cleat that provides excellent support and flexibility for defenders. Ultra-light, these shoes have a synthetic upper (a.k.a. X-Skin) and soft lining to provide maximum comfort that lasts the entire game. With a textured pattern, the X 15.4 lets you take control of the ball at any speed. Just above the X-Skin layer is the X-Cage, which is a reinforced layer that delivers extra support to take on the offense without missing a beat. Finally, the X-Claw stud configuration lets you make unpredictable moves with unmatched acceleration. Ideal for artificial grass or firm ground, the X 15.4 gives you the three things that every defender needs: responsiveness, support and traction. Nike’s Mercurial Victory V CR FG – The Mercurial Victory V line from Nike is designed to give players the support, flexibility and speed they need to make game-changing plays. The C7 is a great choice for defenders because it allows for explosive acceleration. And with a multi-directional grip, these shoes maximize responsiveness, allowing you to be as agile as a cat on the field. The synthetic leather upper is soft, but supportive. An internal cage keeps your foot locked down, maximizing support. A full-length TPU outsole optimizes acceleration, and the light weight of the shoe allows you to perform your best while playing on firm, natural surfaces. adidas Performance Messi 15.3 – The Messi 15.3 from the adidas Performance line looks just as good as it performs. With a black and red base and lime green accents, you won’t have to sacrifice style for performance when wearing these shoes. Design aside, the Messi 15.3 is supportive, comfortable and offers flexible traction. The synthetic upper features a micro-texture pattern that provides better ball control, while the specially designed outsole and stud configuration delivers the responsiveness and traction you need to make cuts without compromising on speed. If you’re looking for a pair of cleats that support your game and looks great out on the field, the adidas Messi 15.3 is a smart choice for any defender. Defenders take a beating, and need to be ready for hard tackles. That’s why durability is such an important attribute when it comes to cleats. Leather tends to be the material of choice for the upper because it’s highly durable and gives you that little extra protection you need to withstand tackles. The added durability will also give you the power to kick the ball up the field. Synthetic uppers can be just as durable, but leather is often the preferred choice of professionals. Responsiveness is important because you need to be able to get to the ball quickly. The wrong shoe will slow you down, making it difficult to stop plays. But the right shoe will deliver explosive acceleration and flexibility, so you can push back the offense. Support and comfort are naturally important for any soccer player. Cleats that leave you with blisters or are painful to wear will only hinder you game. To maximize your performance, you need a pair of shoes that fit comfortably without giving you too much wiggle room. Again, leather is preferred because it’s soft and provides natural cushioning. EVA insoles also offer additional comfort and support. Many shoes also have insoles that conform to the natural shape of your foot, providing personalized support and unmatched comfort.